The Frugal Family Life: Plant Therapy :: Get $10 off any $30 purchase! Today Only! Plant Therapy :: Get $10 off any $30 purchase! Today Only! If you are into essential oils, you should check into Plant Therapy. These are very good quality oils at a fraction of the cost of some of the "other" oil companies. 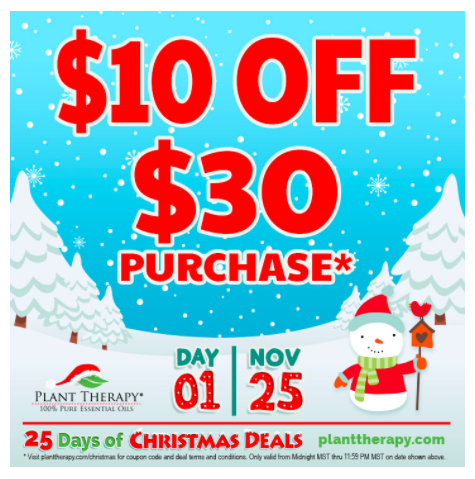 Plant Therapy is offering $10 off any $30 essentail oils purchase, today only (11/25)! Shipping is FREE on all orders! This is part of their 25 Days of Deals that will be going through December 19, 2016!